PT Wijaya Karya (Persero) Tbk - WIKA Group or hereinafter referred to as "WIKA" is a well-established state-owned integrated Engineering, Procurement, and Construction (EPC) and investment company. Based in Jakarta, WIKA focuses on 6 business pillars ; Industry, Infrastructure & Building, Energy & Industrial Plant, Realty & Property, and Investment. The Company was formed in 1960 and originally registered as Perusahaan Negara Bangunan Widjaja Karja (PN Widjaja Karja) with electrical and water pipe installation works as its first business pillar. PN Widjaja Karja was formed by the Government of Indonesia as the nationalization process of a Dutch Company NV Technische Handel Maatschappij en Bouwbedijf Vis en Co or NV Vis en Co. In 1972, PN Widjaja Karja renamed into PT Wijaya Karya. Later in 2007, WIKA went public and its shares are traded in Indonesia Stock Exchange (IDX) with trading code WIKA. As per December 2015, PT Wijaya Karya (Persero) Tbk is 65.05% owned by the Government of Indonesia and 34.95% by general public and investors. In 2015, PT Wijaya Karya (Persero) Tbk has grown significantly. It is shown by its achievement to obtain total revenue with total values at Rp 13,620 billion or grew by9.28% compared to 2014 which valued at Rp 12,436 billion. Total order booked in 2015 was Rp48,52 trillion. This total order booked equivalent with a 15.18% growth from Rp42,13 trillion in 2014, according to PT Wijaya Karya (Persero) Tbk Annual Report 2015 as cited by JobsCDC.com. Minimum Bachelor Degree (S1) in Chemical Engineering, Civil Engineering, Electrical Engineering, Mechanical Engineering or relevant to its field of Engineering. Civil : Staad Pro, Plaxis. Electrical : ETAP, Lighting design software (Dialux, Luxicon, Chalmlite). Piping : CAESAR II/3D Model. Process : HAZOP Study, HYSYS, Pipe Network Software. Instrument : InstruCalc, Smart Plant Instrumentation. Mechanical : Helix, PV Elit, HTRU, TEMA, AMETANK. Willing to be placed at site project. JobsCDC.com now available on android device. Download now on Google Play here. Please be aware of recruitment fraud. The entire stage of this selection process is free of charge. 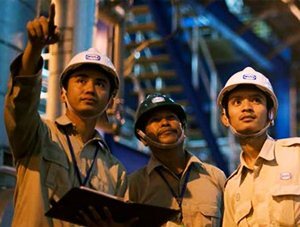 PT Wijaya Karya (Persero) Tbk - Lead Engineer Dept Industrial Plant WIKA October 2016 will never ask for fees or upfront payments for any purposes during the recruitment process such as transportation and accommodation.